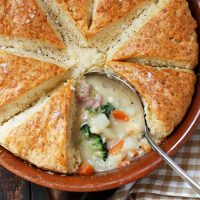 The perfect solution for your leftover ham, this Gruyere Biscuit Topped Ham Pot Pie is comfort food at it’s best! Before I take a little break for the Easter weekend, I wanted to post this one, so you’ll be all prepared if you will have some leftover ham in your future. Inside this pie you’ll find chunks of ham, broccoli, carrots and potatoes. You could easily throw some peas in here, too. It’s all combined with a creamy gravy. On top, is biscuit topping, that cooks right along with the pie in the oven. The biscuits are wonderfully flavoured with Gruyere cheese and lots of pepper. Together with the ham stew, it’s perfection. 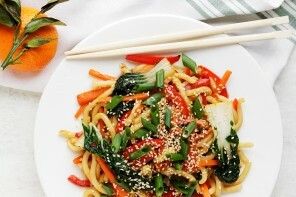 The filling is endlessly adaptable. As noted, you could add peas or substitute broccolini for broccoli etc. The clay skillet that I used here is about 10 inches in diameter and 3 inches deep. You could easily use any round baking dish around the 9-10 inch size. A 10-inch top diameter cast iron skillet would be perfect, but as it is not quite as deep, be sure to place it on a baking sheet as it bakes to catch any bubble overs. Only have a square or rectangular pan? No worries. Simply roll the dough out in to a rectangle instead, place on top of filling and cut diagonal slices instead. If you’re feeding a crowd, you can double the recipe and bake it in a 9×13 pan instead. 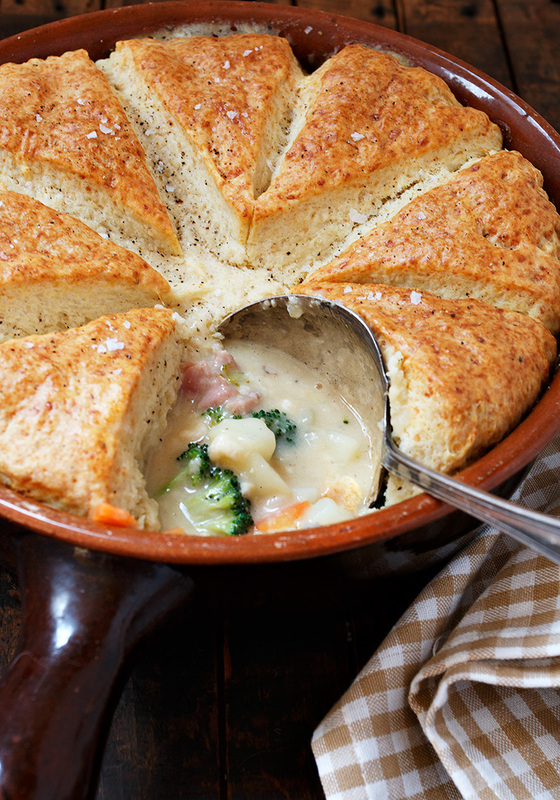 A delicious, creamy ham and vegetable filling, topped with Gruyere cheese flavoured biscuits. Great comfort food and perfect use for your leftover ham! Melt 1/4 cup butter in a large skillet over medium heat. Add flour and cook, stirring, for 1 minute. Add milk, 1/2 cup chicken broth and dry mustard. Stir until smooth. Stir in ham and broccoli. Stir to combine. Remove from heat. Add this mixture to the reserved carrot , potato and broth pot (or the other way around, if one pan is too small to hold it all). Stir to combine. Taste and add salt and pepper to taste (Note that even though ham is salty, you will probably want to add a bit of additional salt). Transfer to baking dish (if not using one of the pans you started with) and set aside. In a food processor, add the flour, baking powder, salt, baking soda, Gruyere cheese and pepper. Pulse several times to combine. With the food processor running, add the butter cubes and process until the butter is about pea sized in the flour. With processor running, slowly add buttermilk, just until the dough comes together in a ball in the centre. You may not need all the buttermilk. Remove the dough to a well-floured surface. Fold dough over on to itself a few times then shape in to a ball (dust with flour as needed to prevent sticking). Using a rolling pin, roll dough in to a circle the size of the top diameter of your baking dish. Transfer dough to top of filling and snug to fit right to edges. 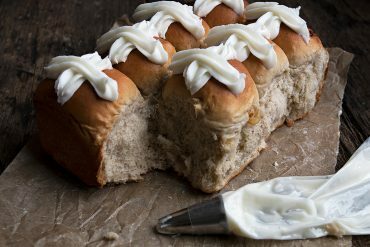 Brush top of biscuits with milk or cream. Using a sharp knife, cut a slit in the biscuits from 12 o'clock to 6 o'clock, cutting almost but not all the way through the dough. Repeat cutting from 3 o'clock to 9 o'clock, then make two more cuts that divide each of the quarters in half again. Place baking dish on a baking sheet to catch any bubble overs. Bake in preheated 350F oven for 25-30 minutes, or until filling is bubbly and biscuits are golden. Allow to cool slightly and set in the pan for 5-10 minutes, before serving. The onion is added to the butter before the flour? That’s what I assumed and did. Thanks so much Robyn :) I love Gruyere anywhere, but it was especially nice in the biscuits! I missed this last week but that was perfectly timed as I have a nice piece of ham leftover from Easter. Gruyere biscuits? YES, please! This sounds amazing! I bet those biscuits are amazing on their own….let alone that creamy flavour packed deliciousness underneath! Who needs to have ‘leftover’ ham to make this….I would totally make ham just to make this :) It’s raining here today so this would be perfect! Hope you had a great Easter! Thanks so much, Dawn :) And yes, raining and cool here in central Ontario, too. A good day to stay in and cook! 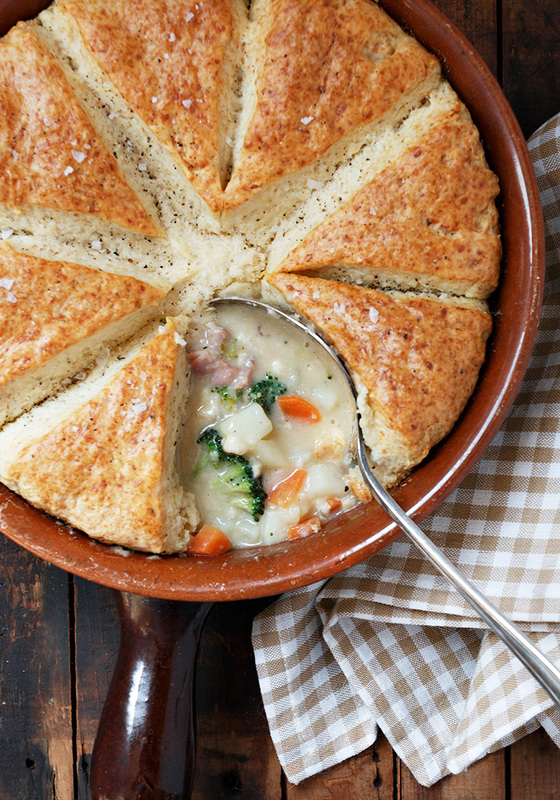 I love your gruyere biscuit topping – what a delicious way to upgrade the classic pot pie! 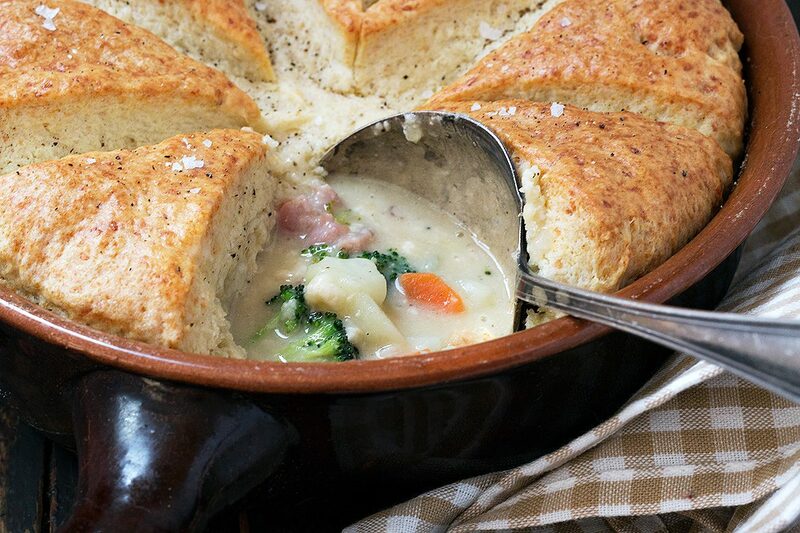 I love that biscuit topping, when I first saw the photos I wondered how you got it so perfect ~ I can’t wait to try this Jennifer, we love pot pies here, but they’re usually the frozen kind ~ happy Easter! The diced ham is already cooked, I assume? Would the biscuits work with a mixer instead of a food processor? Would the biscuits work on their own, just baked on a cookie sheet? 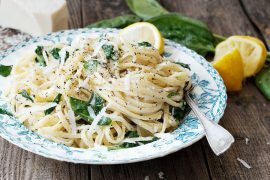 This is going on my “to eat” list! Hi Kathryn and yes, yes, yes :) Sorry, I should have specified cooked ham. I’ve fixed that. And yes, absolutely you could use a mixer with a paddle attachment or just make them by hand in a bowl, by cutting in the butter with a pastry blender etc. And yes, you could absolutely cook the biscuits separately on a baking sheet. I would think pretty much the same temperature and timing would work. Awesome! Thank you for the answers! I’m not the biggest fan of ham, but this pot pie would TOTALLY have me singing a different tune, Jennifer! 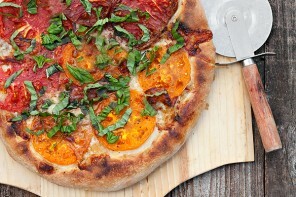 Seriously, I want to make ham for Easter JUST so I can make this with all the leftovers!! LOVE that gruyere biscuit top!! Delicious, my dear! Cheers! What a deliciously awesome idea for that leftover ham Jennifer! My husband Tom will love this even better than the actual ham on Easter! I love the gruyere biscuit topping and so will he!